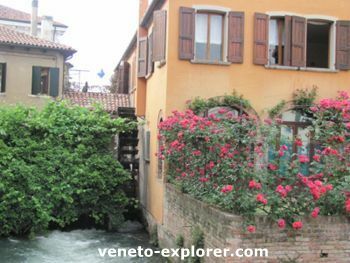 Treviso Italy – the city of water and frescoed houses - is a very ancient small jem in the heart of the Veneto region. Its story is quite complicated: boiling down, it was first inhabited by Venetos and Celts, then conquered by Romans, later turned into a Seignuory and a City-State, before passing under the Republic of Venice in the 1300s. It has been well known since the Middle Ages as the capital of the Marca gioiosa et amorosa – i.e.province of joy and love- for having been the center of a flourishing courtly love poetry and literature. The denomination Marca Trevigiana is still common nowadays and it embraces a territory encompassing Treviso and the surrounding hills and plain, dotted with medieval castles and fortresses, feuds, and charming villages, and blessed with an enchanting natural setting made up of rolling hills covered with vineyards, olive groves and orchards. Treviso may be a great starting point for a getaway towards those hills and small towns of Valdobbiadene and Prosecco, producing areas of the celebre homonymous Prosecco wine. 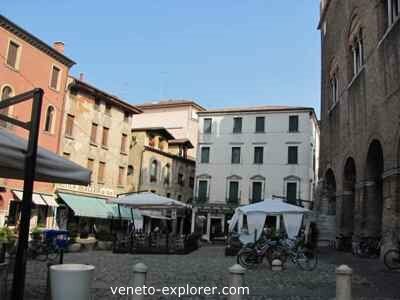 Besides that, towns like Venice and Padua are easily reachable as well from Treviso and surrounding areas. The territory offers great hospitality, with hotels de charme, agriturismi and bed and breakfasts, that often happen to be beautiful restored countryhouses tucked away in a dreamy landscape. The Marca Trevigiana is a real paradise for those wanting to spend a holiday in Veneto in search of excellent food and wine, a lovely landscape with a great historic heritage, and tranquillity. For the sport lovers, there are plenty of trails where to hike, bicycle and horseback ride. 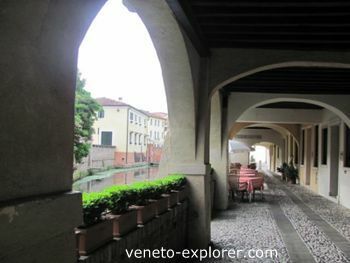 Treviso is a relatively small town and its historic centre can be visited all by foot. I've tried to put together a wide overview of the town, nevertheless you’ll be discovering its charme by yourself by walking around and breathing its atmosphere. Treviso is a lovely town and with no doubt it is worth a visit, but I wish to explain what my feelings are like when I happen to go there. During the Second World War the Allies carried out some bombing runs into Italy and Veneto as well, in towns such as Verona and Vicenza for example. Despite that, their historic centres are still well preserved. Treviso was hit harder though, being seriously damaged by more violent bombings: the most serious damages were made in just one terrible day, that is April 7th 1944, during an aerial bombing causing the death of 2000 people. For this reason you’ll happen to walk along some enchanting cobblestoned alleys lined with typical medieval houses, whose harmony may be spoilt by an (ugly) post-war 6 storeys palace standing in the background or, even worst, attached to a 1200s house. Despite that Treviso certainly still deserves a visit (I would not write about if it wouldn't!). I still find the town very charming and worth seeing, all you have to do is just be prepared to some aesthetically disturbing aspects of it and know the reason why. Treviso will receive forgiveness from you, I guarantee. It is the lively central square, lined with cafès, and the meeting point of people from Treviso. It is the classic Italian piazza, where people use to stroll around or sit outdoor at a bar table sipping a coffee, a glass of Prosecco wine or a spritz, pecking at the typical Venetian’s finger food, the so-called cicchetti, looking at people passing by...they say it is the Italians’ favourite passtime, isn’it? The square hosts interesting buildings, like the crenellated Palazzo del Podestà, and the Torre del Comune, a 48 mt/167ft high tower. But the most significant building of Piazza dei Signori is the Palazzo dei Trecento, whose name means Palace of the Three Hundreds. The name comes from the fact that in the Middle Ages it would host the City Council, made up of 300 citizens, 50% nobles and 50% belonging to lower classes. It is a big medieval building with arcades and a portico hosting bar tables and occasionally assemblies. You can go there passing under the pictoresque portico named Sottoportico dei Soffioni, so called for the wind always blowing across it. Noteworthy is the medieval building used as a pawnshop. Just a few steps forward you’ll pass under another portico up to to Piazza San Vito with its two interesting churches. 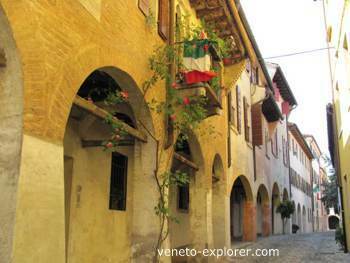 From Piazza dei Signori starts via Calmaggiore, a road lined with beautiful decorated palaces. At the end of the road stands the imposing tower bell of the San Giovanni baptistry dating back to the 11th century. Nearby lies the Cathedral, built in the 11th-th century, but remodeled several times, causing a blending of different styles. 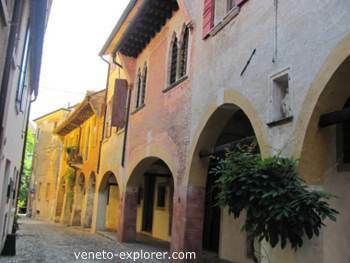 Do not miss a look at via Canoniche and its antique mosaics, just behind the cathedral. Not far from the Cathedral there is via Roggia, a street lined with porticoes and sided with a pictoresque canal. Enter the back alleys, and do not miss the evocating cobblestoned via del Gallo for a dive into the Middle Ages: you won’t find there noble palaces but houses belonging to lower classes during the medieval times. The beautiful Church of San Nicolò (accent on last o), one of the most significant monuments of the town, dates back to the late 1200s. Take a look at the nearby former Convent of San Nicolò. Take advantage of the free visit to the cloister and most of all to the Sala del Capitolo, decorated with fine and precious 1300s frescoes representing 40 of the most illustrious friars belonging to the Dominican order. Interesting is the fact that one of the friars is depicted with a pair of glasses on: it is about the first representation of glasses in the art history. Last but not least, don’t miss the most suggesting corner of the town: the so called canali dei Buranelli, or Buranelli canal. It takes its name from Burano, one of the islands of Venice, as the merchants coming from Burano would get there with their boats. Treviso was connected to Venice through a thick network of canals, but unfortunately nowadays many of them are filled in. 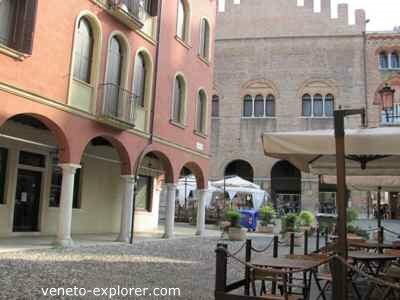 A few steps away take a look at Piazza Rinaldi, a beautiful square lined with 1500s palaces. 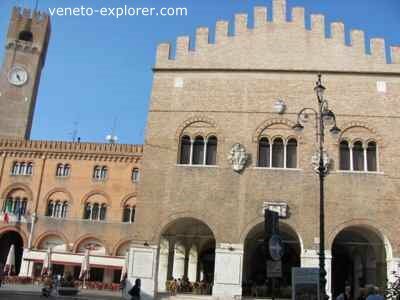 This area is the authentic Treviso, dotted with hostarias and typical food and wine stores. Upon a small island lies the fish market (pescheria). Nearby you can admire two ancient water mills: they are what is left of a series of water mills that were in the historic centre of Treviso. If you like to discover charming towns you should not miss during your Veneto holidays the city of Vittorio Veneto, a very ancient town in the Treviso province, full of atmosphere and surrounded by a lovely hilly landscape. Another interesting town in the Treviso province is Castelfranco Veneto , a medieval walled city with imposing circular walls and ramparts. Another interesting destination in the province of Treviso Italy is the charming archaeological small town of Oderzo , rich in pre-Roman and Roman finds.